By Dominic J. Balascio, Esq. Whether you’re buying or refinancing a loan for a residence, commercial property or business, it will require you to obtain a licensed Delaware real estate attorney to facilitate the closing process. You have a lot of important rights which the attorney will protect. Moreover, by structuring the transaction correctly, the attorney may be able to save you significant sums of money now and in the future. During the contract negotiations , the attorney will ensure that necessary provisions are included in the purchase agreement to protect you, provide good title and protect you from any liabilities (like environmental liabilities). Prior to closing, the attorney will review title documents to make sure you are getting good title and understand any limitation on the property (like a restriction). At closing, the attorney will review the loan documents that you will need to sign and advise you on necessary provisions to safeguard you. A lot of people wait to choose a closing attorney after they have already signed the contract to purchase the residence, commercial property or business. However, you should select a real estate attorney at the same time you are looking and prior to executing any contract to purchase the property or business. The attorney will review any proposed purchase contracts and addendums to make sure it adequately protects you. For example, the attorney will ensure that the contract adequately describes the property, provides for the manner of reimbursement of your deposit should you decide not to move forward with the purchase, your rights to conduct due diligence, provide a financing contingency in case you do not get approved for the loan, and protect you from any liabilities. Contract review is extremely important. You want to make sure you are receiving all of the benefits you are anticipating. Most people do not realize the costs that are associated with a new loan or refinancing a current loan. Some of these costs include title insurance, transfer tax, lender’s fees and costs, recording costs, sewer, water and property taxes, property insurance, among others. In 2010, for residential purchases, the Department of Housing and Urban Development put new standards in place to help the consumer understand their closing costs upfront. The new standards require every lender to provide a consumer with a Good Faith Estimate (“GFE”) for any residential loan. The GFE provides the breakdown of your costs and fees and the total estimated amount needed at closing. This permits your attorney to work with you to understand the costs associated with you loan. Moreover, the same principles apply to the purchase or refinance of a commercial property or business (even though the GFE is not required). All too often, the borrower is surprised by closing costs which could have been addressed early on in the process. Your closing attorney will order a title search on your property prior to closing. Title searches will disclose any open mortgages or judgments on the property, in addition to confirming ownership of the property and any recorded encumbrances such as easements, restrictions or right-of-ways. It is very important to deal with any title problems that appear on a title search. You always want to hold clear title to your property. Sometimes an old mortgage will remain on title that has been paid but not yet satisfied of record. Your closing attorney will work with you to remove that mortgage of record. The title search will also show if there are any restrictions on your property. You should know if your development or property is subject to any restrictions, including those which limit the type of improvements you may construct on the property. In many instances, properties are subject to architectural guidelines which limit a whole array of items. It is better to know about these now then down the road once you are trying to do something with the property. Your attorney will also assist in providing title insurance. Title insurance protects the lender and the owner from any title problems that may arise in the future that were not disclosed by an accurate title search. Some of these title problems include the following: fraudulent title documents; deeds granted by a person of incompetence; deeds granted by minors; misinterpretation of a will or trust; errors in tax records; marital rights of spouses, etc. Title insurance is not like most insurance. The premium for title insurance is only paid one time, not monthly or annually like other insurances. An owner’s title insurance policy is usually purchased when you first buy the property. Lender’s title insurance policies are purchased at the time of the loan closing. It is important that you discuss with your real estate attorney how you should take title on the deed. There are various advantages for a husband and wife to take title as tenants by the entirety. Also, there may be advantages of taking title in the name of a trust, rather than individually. Likewise, in the case of a business, it should be considered for a limited liability company or corporation to hold title to the property. Often, the attorney will work with you to look at your personal estate plan and business plan to make sure that you are properly planning for the future. 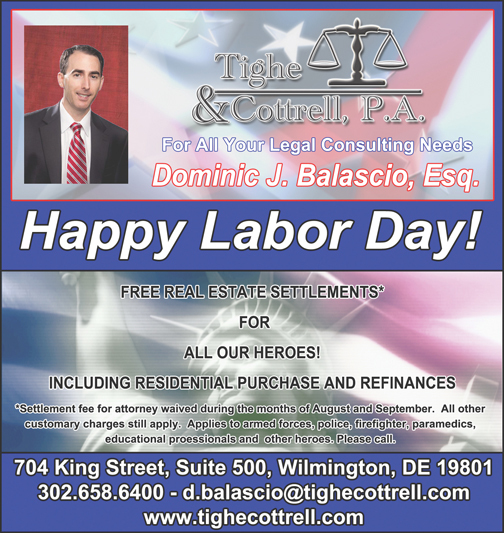 If you have any questions or concerns, please feel free to contact Dominic J. Balascio, Esq. and Melissa L. Rhoads, Esq. at (302) 658-6400 or d.balascio@tighecottrell.com andm.rhoads@tighecottrell.com. Dominic J. Balascio, Esq. and Melissa L. Rhoads, Esq. are attorneys at Tighe & Cottrell, P.A. at 704 King Street, Suite 500, Wilmington, Delaware 19899. The firm offers many discounts for first-time homebuyers, personnel in the military, police, firefighters and educational professionals. Next Story → Delaware Workers’ Compensation Benefits – Smile! You Could Be On Candid Camera!